Learn all about the Demio Referral Program. As a valued user of Demio, we want to reward you for your continued support and championing. That's why, we've introduced the Demio Referral Program! 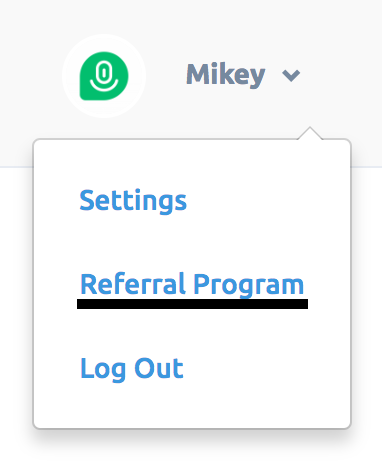 It's an easy way to give credit and earn credit to every single friend/colleague that signs up using your referral link. That's what we call a win-win-win! Applying to the Demio Affiliate program is super simple! You'll want to hop over to our Affiliate Hub here. Once you're there, you'll need to fill out a few quick form fields—your name, your email, and a password you'd like to use! As soon as a user upgrades to a full-fledged plan, they'll get $25 in Demio credit applied to their account and automatically used on their first month's payment! Even better, you'll earn $100 in Demio credit each time a user you refer joins and becomes a paid user! Getting up and running on our Referral Program is easy-peasy! You'll want to jump into the Referral Program Dashboard. * If you're a Demio Affiliate, check out our brief note below. Once you've been signed up, all your details will be shown on this page! Any credit that is added to your account will be reflected on the Billing settings page of your account! With our new Referral Program, we'll be enacting a policy that only allows users to be a part of one program at a time. However, we're more than happy to move you from one program to another! If you're an existing Affiliate and wish to use our Referral program instead, you'll need to contact us directly. Simply request the swap and we'll move you over to our Referral program. Even if you switch, we'll continue to pay any past commissions!